Learn about the Flir TG167 74701-0104 NIST Thermal Camera. Includes features, pricing, and frequently asked questions. 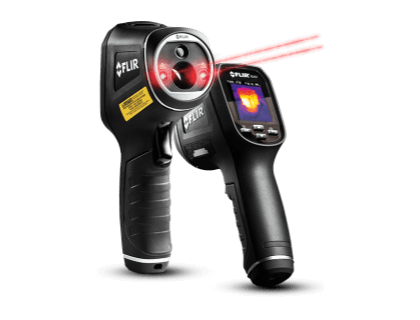 The Flir TG167 Spot Thermal Camera is a thermal imaging camera designed for home or building inspection, allowing you to easily find unseen hot or cold spots, and store images and data for reporting. The Flir TG167 74701-0104 NIST Thermal Camera retails for $599.99. Power supply with a separate USB cable. How clearly can the Flir TG167 Thermal Camera see? The Flir TG167 has a 25° field of view (FOV) providing image clarity on the tiniest details from a distance, including small connectors and wires. The IR resolution is 80 × 60 pixels. How can I save images and data for reporting purposes? The Flir TG167 kit includes an 8 GB Micro SD card which saves up to 75,000 pictures, however the camera supports up to 32 GB. In what kind of environment can I use the Flir TG167 NIST Thermal Camera? The Flir TG167 can operate in the harshest environments and is durable enough to withstand a six-foot drop. Where can I buy the Flir TG167 NIST Thermal Camera? You can buy the Flir TG167 NIST Thermal Camera from sites like Amazon, or directly from Flir.com. What are some Flir TG167 NIST Thermal Camera alternatives?